MainAll NewsForeign AffairsChinese Hypersonic Vehicle Can Defeat US Defenses? Chinese Hypersonic Vehicle Can Defeat US Defenses? Wu-14 test shows 'extreme maneuvers' that could render US defense systems 'obsolete' and deliver a nuclear strike. The Chinese military on Sunday conducted the fourth successful test of a hypersonic vehicle capable of delivering nuclear strikes, and in the test conducted "extreme maneuvers" that intelligence officials say are meant to test the ability to dodge US anti-missile defense systems. The Wu-14 hypersonic strike vehicle was launched on a ballistic missile in western China, as was exposed by the Washington Free Beacon on Thursday. It marks the fourth test in 18 months, after previous experiments last year on January 9, August 7 and December 2. 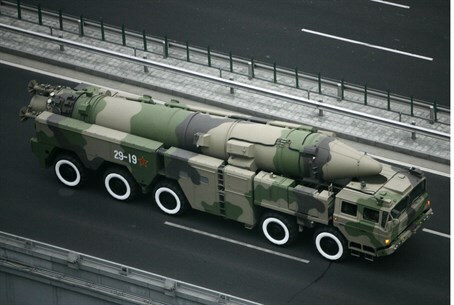 The frequency of the tests illustrates the great emphasis China is placing on the development of the new weapon. The vehicle flies high in the upper atmosphere near outer space, making it difficult to detect. It can move at blazing speeds, reaching an estimated speed of ten times the speed of sound, or about 7,680 miles per hour. One US official told the Washington Free Beacon that in the new test, the Wu-14 for the first time showed "extreme maneuvers" meant to foil anti-missile defense systems which operate on predictable trajectories, meaning the vehicle could dodge past defenses and deliver a nuclear blow. A congressional China commission statement cited in a report last November revealed that China is focusing on the weapons, noting, "hypersonic glide vehicles could render existing US missile defense systems less effective and potentially obsolete." "With four tests in about a year and a half, it is possible that China could conclude development of an early version for deployment in one to two years," said Rick Fisher, an expert on China at the International Assessment and Strategy Center, to Washington Free Beacon. Fisher added that, "perhaps the most important US antidote for China’s hypersonic maneuvering warhead is US energy weapons programs. There is an urgent need to increase funding to accelerate the early deployment of rail gun weapons." Rail guns fire pellets at hypersonic speeds, creating pellet clouds which can damage or destroy the Chinese hypersonic vehicles. "It is urgent that the US speed the deployment of rail guns to defend aircraft carriers, large combat ships, and major US military facilities in Asia," Fisher said. "The US also needs to accelerate the development of its own hypersonic weapons, ground, air, and sea-launched, to deter China’s use of these weapons." Currently the US Army has only held two tests of its Advanced Hypersonic Weapon - in the last test, the missile launcher blew up just after liftoff. Video of a Chinese media report on the first January 9 test of the Wu-14 can be seen below, in Chinese.